A man was fatally shot on Oak Hill Road in Swanville early Friday morning, police say. 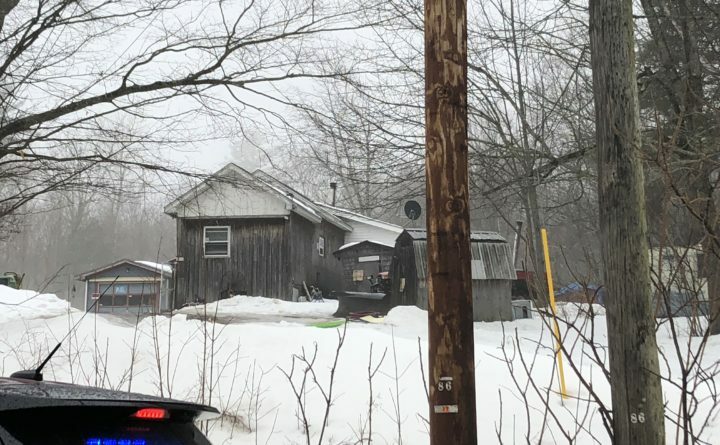 SWANVILLE, Maine — The Morrill man who allegedly shot another man to death over a shared love interest last week will be held without bail pending a court hearing next month. Austin McDevitt, 22, of Morrill, who has been charged with murder, made his first court appearance Monday afternoon at the Waldo Judicial Center in Belfast. Justice Robert Murray ordered that McDevitt be held without bail until a bail hearing April 12. A state police affidavit, also released Monday, states that McDevitt said he shot Shane Sauer, 26, of Belfast seven times after Sauer jumped him in a camper where McDevitt and the woman they were fighting over were sleeping. The affidavit states that McDevitt told detectives he was familiar with Sauer because they were both in a relationship with the same woman. He said the woman was in the process of breaking up with Sauer. A Waldo County dispatcher received a 911 call from a woman at 4:46 a.m. Friday, according to the affidavit. A second woman told the dispatcher that there had been an incident at 568 Oak Hill Road in Swanville. The phone went dead, but a second call from a woman soon thereafter alerted police to a shooting and identified McDevitt as the shooter. McDevitt said he was awakened early Friday by Sauer hitting him in the face. McDevitt and Sauer fought inside the camper, located behind a mobile home where the woman’s family lived, but then separated. McDevitt reportedly told detectives that he grabbed a handgun from his car and that he shot Sauer, who allegedly threatened to kill him while they were outside the camper. While McDevitt was retrieving his gun, Sauer stayed briefly inside the camper with the woman, who told police that Sauer was crying and upset because she was with McDevitt. As Sauer was walking out of the camper, the woman said she held his hand. McDevitt shot Sauer three more times before he fell to the ground, then shot him three times when he was on the ground, according to the affidavit. An autopsy confirmed that Sauer had been shot seven times, including three shots to the head. After shooting Sauer, McDevitt said he did not try to help Sauer. Instead, he walked past Sauer’s body and went back into the house to find his boots. When he couldn’t find them, McDevitt left the scene because the woman’s family came outside and “were hostile toward him,” according to the affidavit. McDevitt then drove to the Belfast Police Department to report the incident. Since the grand jury has not indicted McDevitt on the murder charge, he did not have to enter a plea during Monday’s court hearing. Assistant Attorney General Leane Zainea said the case will be presented to the Waldo County grand jury in May. McDevitt is being represented by Rockland attorney Rick Morse. McDevitt has been held at the Two Bridges Regional Jail in Wiscasset since his arrest Friday.